In creating the scholarships that bear his name, Cecil Rhodes had two great objectives: the promotion of public-spirited leadership and of harmony between nations. His vision was that these could be achieved by giving life-changing educational opportunities to outstanding young people with ‘instincts to lead’, and so contributing to a network of people-to-people relations between countries. 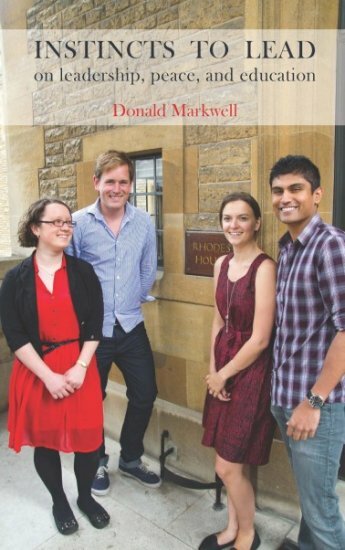 In this volume, the former global head of the Rhodes Scholarships, Dr Donald Markwell – the first Rhodes Scholar to hold that position – discusses how good leadership can be promoted, drawing on examples of leaders from Nelson Mandela to Margaret Thatcher, as well as other leaders in politics, education, culture, intellectual thought, and more. The vision of Cecil Rhodes to promote international peace through scholarships that would create ‘educational relations’ between countries is illustrated here through the experience of the German Rhodes Scholarships in the 20th century, and points to the value of scholarships to engage China and other countries in the 21st century. A scholar of international relations, Dr Markwell also discusses other approaches to promoting peace and preventing war. In papers from his experience as Deputy Vice-Chancellor (Education) of the University of Western Australia and as Warden of Rhodes House, Oxford, Dr Markwell discusses the spirit of a university, the value of liberal education, and the importance of collegiate education and of student engagement in the extra-curricular life of a university campus. These are educational values which the Rhodes Scholarships have promoted, and which are important to prepare students well for the challenges of a century of global forces and rapid change. Rhodes Scholar for Queensland for 1981, Dr Donald Markwell served as Warden of Rhodes House, Oxford (2009-12); as Deputy Vice-Chancellor (Education) of the University of Western Australia (2007-09); as Warden of Trinity College, University of Melbourne (1997-2007); and as Fellow & Tutor in Politics at Merton College, Oxford (1986-97). He has headed the Menzies Research Centre, an Australian public policy think tank, since 2012.
v. ‘A force for internationalism’: why study the Commonwealth? x. Assuring academic quality: what makes an effective Academic Board?